A fun summer drink or one with a lot of serious health potential, we offer the finest quality Thai basil seeds from Hand Brand. Basil seeds are used to make basil seed drink (shown below). Very unique in appearance, it's a delicious beverage and a centuries-old way for Thai people to lose weight naturally. Add the seeds to water and they expand, turning into little jello-like bulbs that slither down your intestines, this is thought to help carry toxins out of your body. Basil seed also a delicious added flavor for Thai coconut icecream. This is a great deal, as we give you 3.5 ounces which is 12+ teaspoons of seed! Please click here to learn more about Thai basil seed drink. All natural. Product of Thailand. See our prestigious testimonial below: ImportFood.com is the recommended supplier of basil seed to the American Japanese community. Dear Sirs: Hello. This e-Mail is regard to your web site with basil seed, and its information. My mane is Dr. Masahiko Matsushita, D.C ., L.C.P., and I am a licensed chiropractic physician who has private practice at Arlington Heights, Illinois. 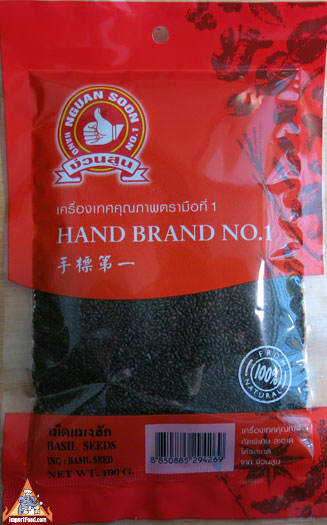 I purchased basil seed from your web site in the past, and I am really satisfied with its quality and price. Also I have known that we can use it for losing weight. Therefore, I put about your web site (URL) and basil seed information to Japanese community free newspaper in Midwest area, which name is "WEEKLY JANGLE." I am a writer for "Health column" in the newspaper as a physician. Your information on my column will be on this Friday's issue of the newspaper "Jangle." You will be receive a lot of orders from Japanese people from all over the Midwest area of USA after the publication. I also will send a copy of the newspaper to you. I just try to let you know waha I did for both your company and Japanese people. Please take good care of your future Japanese customers. At the left is a glass of Thai sweet basil seed drink. It's delicious--the seeds become soft with a consistency similar to eating watermelon. Also, according to Thai tradition, this drink also helps a person lose weight. Ice cream is served throughout Thailand just as it is in many countries. Often served by bicycle vendors or via motorized carts, as shown in pictures below. Here is a basic ice-cream recipe using coconut, the most common ice-cream flavor, producing a rich, creamy ice-cream we know you'll enjoy. We've enhanced it with sweet basil seeds, giving an interesting texture & subtle fruit flavor. We highly recommend that you make this recipe just as described, served with the chocolate-ginger ganache and fragrant Thai cookies. It's an unbelievably perfect balance of flavors, the type of dessert found in the most prestigious, not just Thai, restaurants. This dessert really spans the international spectrum of culinary appeal, people will rave about it for weeks after trying it. Idea: Dairy Queen in Thailand offers Thai ice-cream topped with pandan sticky rice.